Sorry that I’ve been absent lately, I’ve been so busy! I have still been slow cooking away, just haven’t had time to sit and post a recipe. This recipe is well worth the wait! Cheesy Bacon Scalloped Potatoes- OH MY! These taters are so good. I’m sitting here eating that big plate of them as we speak, maybe I’ll start my diet tomorrow…. Spray a 6 quart slow cooker with non-stick spray. Mix together sour cream, cheese, bacon, onion powder, salt, and pepper in a large bowl, add sliced potatoes, and stir. Pour mixture into the slow cooker, and flatten with spatula. Cover, and cook on HIGH for 3½ hours or until potatoes are tender. Stir carefully, trying not to break up potatoes, and sprinkle with more paprika if desired. Enjoy! These so comforting and delicious! Can’t wait to try them! Thanks for sharing! YES PLEASE! Cheesy scalloped potatoes are one of my favorite things in this world! Theses look delicious! I love scalloped potatoes! I haven’t tried them in the slow cooker yet but I will soon! These look fantastic! OH I wish I had this recipe for Easter — I really needed it! But I will save it for next time — thank you! Oh these sound great! And, I’m always looking for vegetarian recipes for the slow cooker (well, I’d leave the bacon out). This sounds fab! thanks so much! 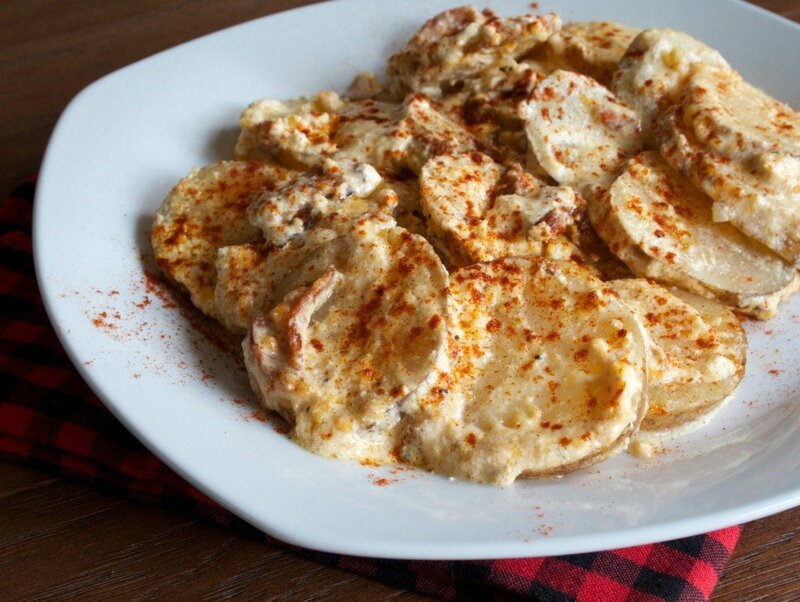 I love scalloped potatoes too! In fact made them this afternoon with ham in them. So tasty and I love it that yours are done in the crockpot. These looks so good and I love how easy they are to make! Looks and sounds sinfully delicious! I’d be putting the diet off a day too! Yum! All of my favorite flavors in one dish!